My scales seem to be STUCK this week but I just keep powering through with my keto macros and daily workouts. I’m doing a really simple home workout, but I’m doing it consistently. It’s 10 squat lunges, 20 tricep dips, 20 donkey kicks and 20 glute bridges. I’m FEELING that too, but I’m going to be adding in more body weight and toning exercises as I can. 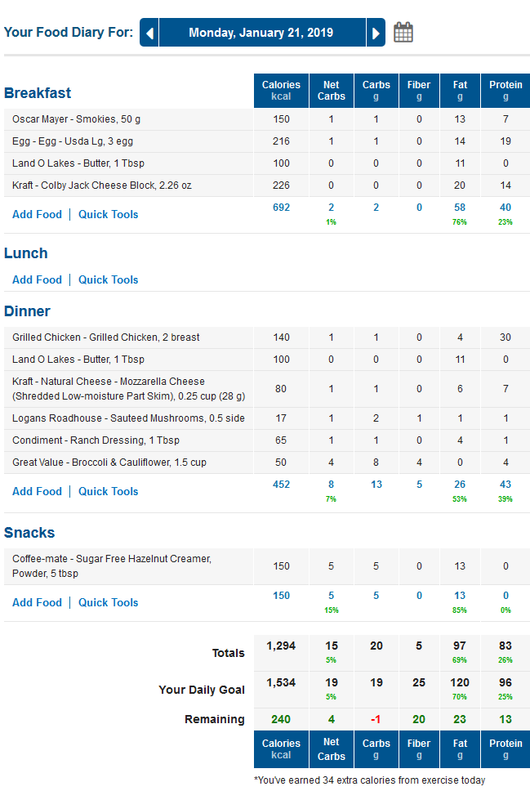 I didn’t have much of an appetite Sunday and Monday so my calories are way lower than usual, but still no movement on the scale. 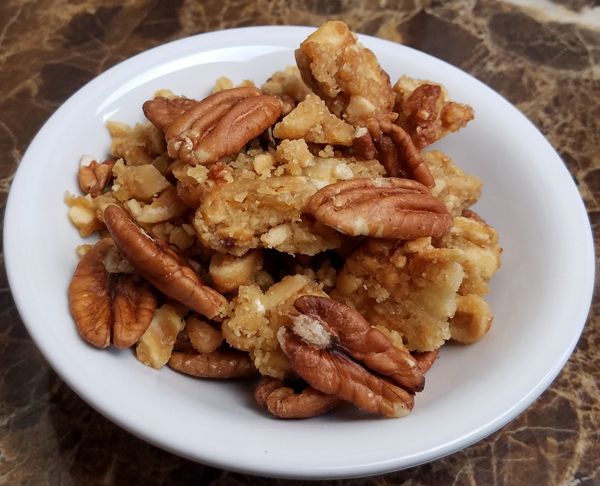 I had a quick snack-style breakfast at my desk on Saturday morning: one 30 gram serving of raw pecans and two servings of Peanut Butter Macadamia Keto Granola (that’s our discount link) – with my usual coffee and water of course! 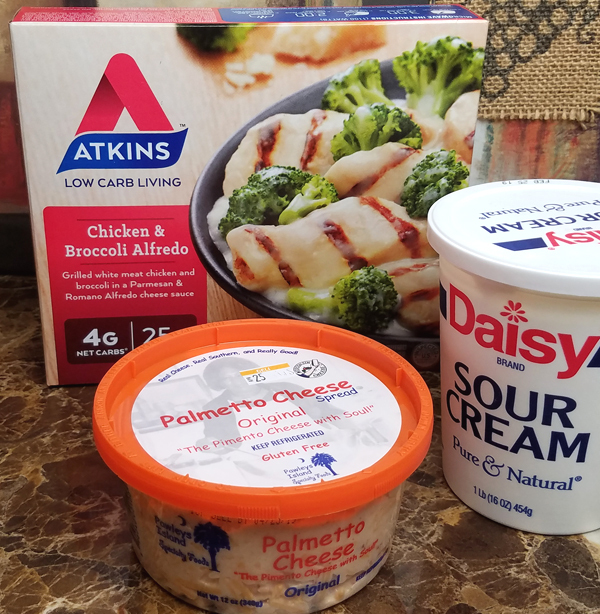 I had cheesy scrambled eggs for lunch, then I went to Kroger to pick up some almond flour for some baking I wanted to do this week. 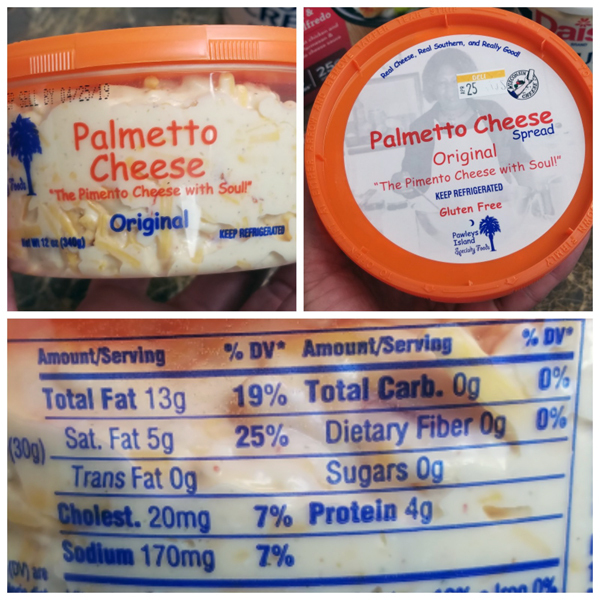 While I was there, I spotted this great find in the Kroger Deli: a zero carb pimento cheese! And it’s DELICIOUS. 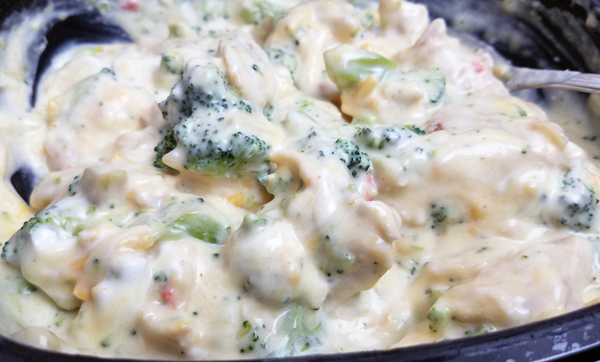 I cooked the Chicken & Broccolo Alfredo by the instructions, then topped it with both pimento cheese and Daisy brand sour cream. But the REAL magic happened when I stirred it all together! 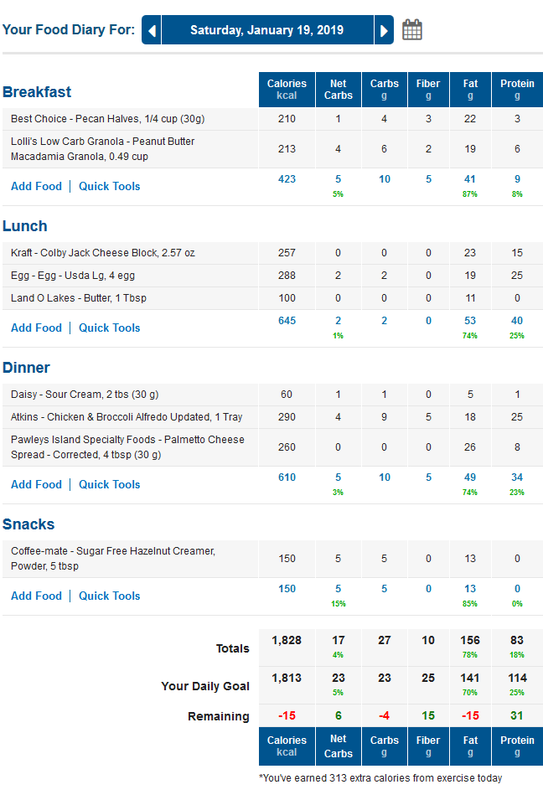 You’ll notice that Protein is only 18% of my total daily calories, yet I had 83 grams of protein. The recommended daily amount of protein for women is 46 grams a day. I know this is not a “traditional breakfast” lol, but that pimento cheese is SO good I decided to make a snack plate to take to my desk while I worked on some creative projects. 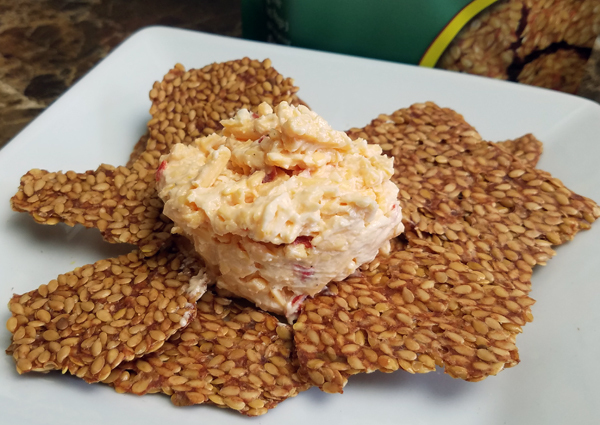 I ate the pimento cheese with both Onion Garlic Flax Crackers and FBOMB Keto Krunch cheese crisps. 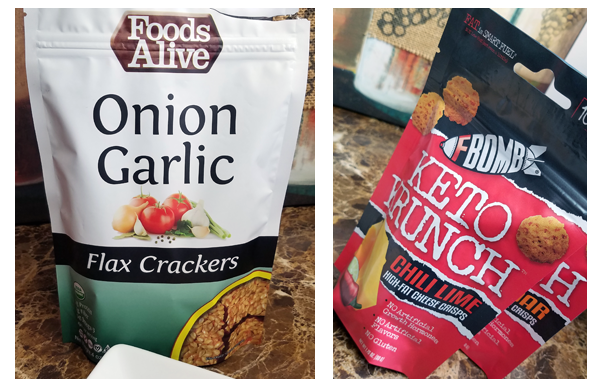 I’ve never been a fan of flax crackers, it’s just a texture thing for me, but these did have really good flavor. 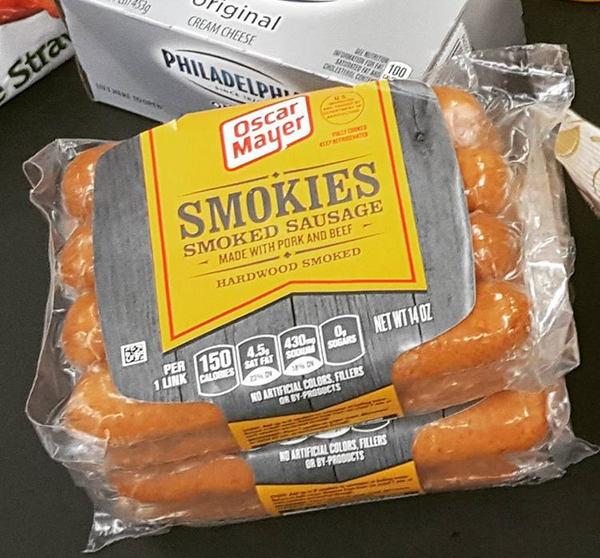 I don’t like the baked cheese products either, again just a preference – I find them ALL too salty. But FBOMB does make good clean products. 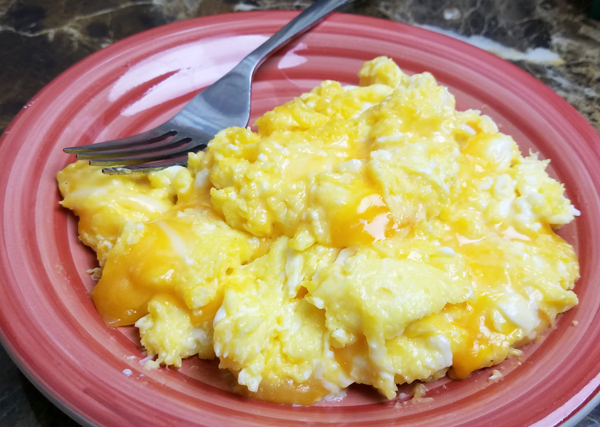 I had cheesy eggs again for lunch/dinner. I snacked on my first plate throughout the day, and didn’t even end up finishing that. I just didn’t have much of an appetite on Sunday. 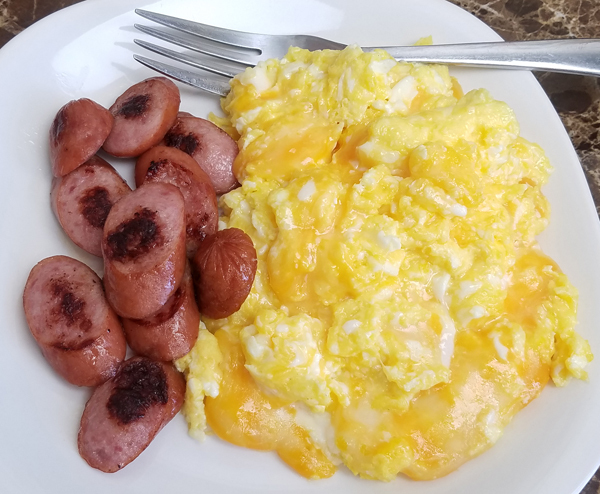 For breakfast I made cheesy eggs and fried up an Oscar Mayer Smokies link to go with those. I had some errands to run in the afternoon so I picked up dinner at Gondola, a Greek/Italian place. I ended up making two meals out of that. Oddly no appetite yesterday either. But what I did eat was great! I’ll have some fun Instagram Giveaways rolling out this week! If you’re on Instagram, be sure to follow me: @LowCarbTraveler on Instagram if you aren’t already. And you may want to “turn on notifications” for my posts this week, because I’m going to roll out some FUN “100K Giveaways” for some of your favorite keto products. Any thoughts or questions on today’s food diary? We have Weigh-In Wednesday tomorrow, so I’ll send you the link for that in my next post. p.s. 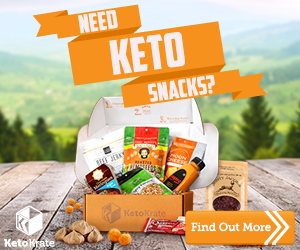 If you missed it I did a detailed Value Breakdown on this month’s Keto Krate box, which includes 13 keto snack ideas. Are you doing it online or on your mobile app? 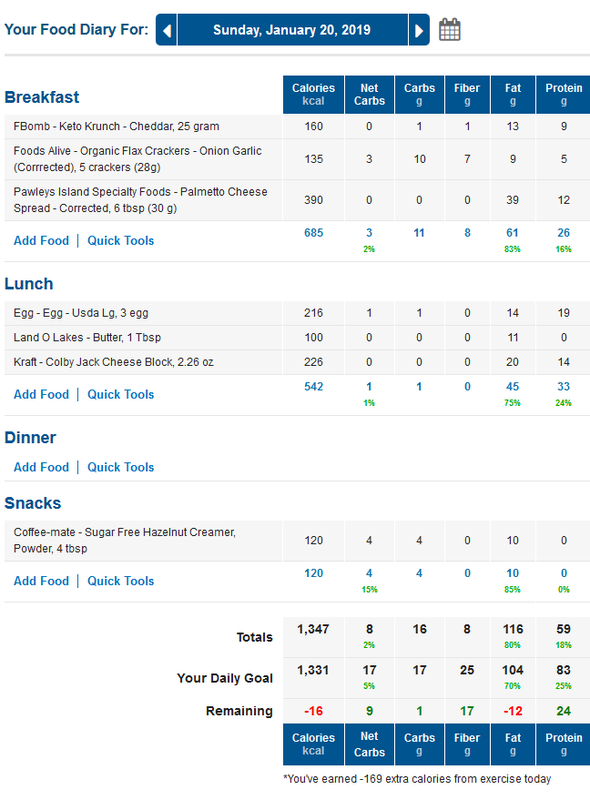 I use the free version of MyFitnessPal and this is how I have mine set up: https://www.travelinglowcarb.com/4448/myfitnesspal-hack/ I set it up online and it shows net carbs online in Firefox or Chrome only, but on the mobile app I still see the macronutrients I set up to track (fiber included) and can just subtract fiber from carbs on the go. I just ordered the peanut butter macadamia keto granola! I can’t wait 🙂 Thank you for your code!! You are going to LOVE that peanut butter macadamia flavor! It reminds me of fresh baked macadamia cookies – SOOOOO good!!! My scale is still stuck. Has been for two weeks! Hoping to see some movement too! Lost 5 lbs initially but not since the first week! The key is to power through that phase and just keep doing what’s obviously working so well for you. Or if you changed anything, go back to what you were doing that first week. I just went through the same thing, then dropped 3 pounds in the last two days, lol. It’s just part of the wonky weight loss trend – the way things work! If you like spicy, the have that Palmetto cheese with jalapenos..That is the bomb! 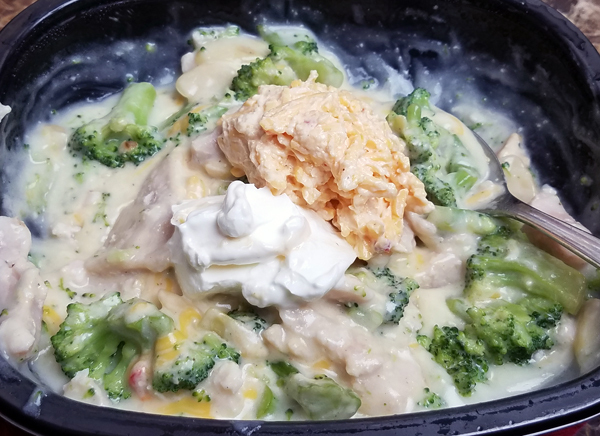 Thank you for all your post and ideas for new meals…. Good to know, Dorothy – thank you! And you’re welcome. 🙂 I’ve heard it comes with bacon too, and that they have a chicken salad out now that’s great. I’d love to try the chicken salad next! I LOVE reading your posts! They are so helpful. I noticed you always use powder flavored creamer and I wanted to see what your thoughts are on the liquid creamer…like the Int’l Sugar Free flavors. Is there a reason you only use powder? Thank you for getting back with me: I bought some powder creamer to try. I did have another question. Are you in maintenance eating now or still weight-loss goals? I’m asking because your calories and fats seem higher than i would think for weight loss. I’m just getting started and it’s SO confusing. 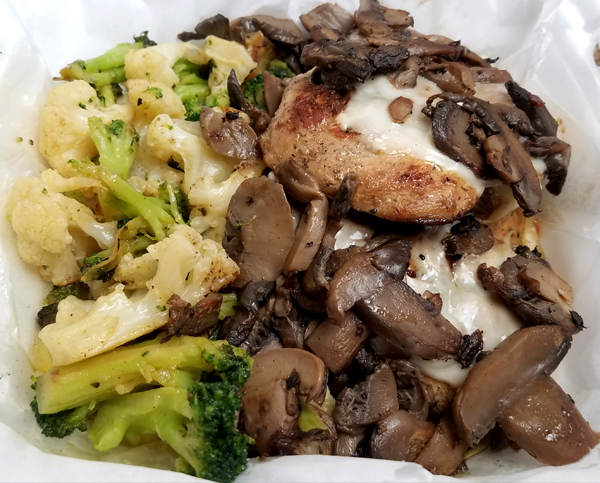 Some people say you shouldn’t eat all of your allotted fat grams and some people say you should always try to eat to your fat macro. I am still losing weight – or again I should say. I dropped 3 pounds this week. 🙂 I started “mysteriously” gaining weight after 3 rounds of antibiotics and 2 rounds of steroids almost 2 years ago and have been battling “gut health” issues ever since. I’m only ~7 pounds over my ideal weight at the moment, but I’m definitely still in weight loss mode. I’ve never had to count or worry about calories – at any point in my keto weight loss journey.